Don’t miss an advance screening of the powerful new Hulu documentary “Crime + Punishment,” winner of a special jury award for social impact filmmaking at this year’s Sundance Film Festival. 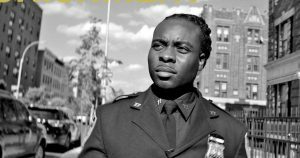 The film chronicles the NYPD 12, a group of twelve minority cops who blew the whistle on an alleged quota system that disproportionately targets minority neighborhoods for arrests and court summonses. Following the screening, New York Times Op-Ed columnist Charles Blow, who has written extensively on racial disparities in criminal justice, will discuss the film and the NYPD 12’s class-action lawsuit against New York City and the NYPD with director Steven Maing, lead NYPD 12 plaintiff Edwin Raymond, NYPD 12 officer Felicia Whitely, NYPD 12 lawyer Emeko Nwokoro and private investigator Manuel Gomez.